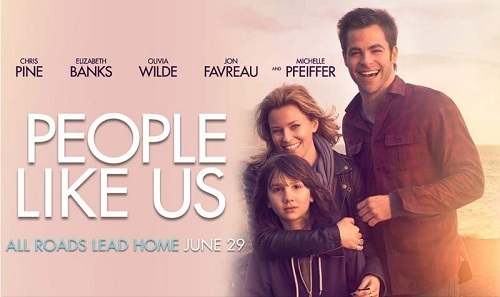 Writer/Director Alex Kurtzman is known for writing high-tech, extraterrestrial, action flicks like Transformers, Star Trek, Cowboys and Aliens and TV shows like Fringe and Alias, so a family drama like his latest movie People Like Us, is quite a departure. But it's the fact that this story was inspired by Kurtzman and writing partner Roberto Orci's own life experiences with long lost siblings, that keeps them from being out of their depth. Sam (Chris Pine) is a fast talking, ambitious young man who in the initial scenes seems to be cocksure and on top of everything. All this comes crashing down around him when he makes a big oversight at work, costing him a commission, one which we find out he desperately needs. All this gets put on the back burner when he learns of his father's death and has to go home to face his estranged parents – his indifferently hostile mother (Michelle Pfeiffer) and the memory of his less than doting, big record producing deceased father. The film does an excellent job of building on the character of Sam's father without ever showing more than a picture or two of this man who managed to be at the center of so much hurt and admiration. It's his father's last instructions to his son to deliver $150,000 to a woman (Elizabeth Banks) and her son (scrappy newcomer, Michael Hall D'Addario) living in a cheap motel-like apartment, that becomes the catalyst for Sam to discover himself and what he truly values. My fear is that audiences may dismiss the film as too predictable and/or too sentimental, but on the whole, it's well-written. There's an interesting dynamic as Sam and Frankie (Banks) get to know one another; she warily thinking of him as a potential romance. He knowing who she is but trying to first size her up to see if she deserves the 150K and then realizing he's lost the window of time to be honest. Ultimately, everyone gets to know each other as – People Like Us.